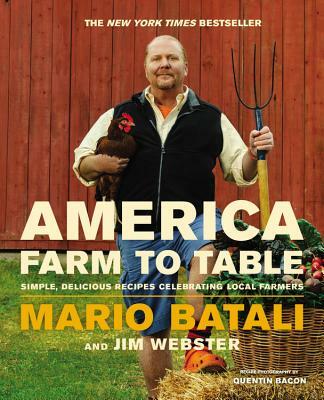 In Seattle, Chef Matt Dillon introduces readers to Farmer Pierre Monnat, who produces fava beans and lamb. Batali then features those ingredients in such mouth-watering recipes as: Lamb Shank Sloppy Joes and Fava Bean Guacamole. In Washington, DC, Chef Jose Andres from Jaleo introduces us to Farmer Jim Crawford, who grows corn, broccoli, and strawberries Batali's accompanying dishes include: Chilled Sweet Corn Soup and Grilled Salmon with Strawberry Salsa. Other stops along the way include: Tampa; Austin; Nashville; Las Vegas; Los Angeles; New York, San Francisco; Portland, Maine; Chicago; Cleveland; Suttons Bay, Michigan; and Vail, Colorado. With over 100 superb recipes, this is the book that every home cook will want upon returning from the farmer's market or grocers. Jim Webster is a newspaper copy editor, writer, blogger, culinary tourist and amateur caterer. He works at The Washington Post and has worked at the Miami Herald and St. Petersburg Times.